The Altadena Guild was founded in 1951 in order to extend and enlarge the work of the Women's Auxiliary of Huntington Hospital in Pasadena, California, which had been formed 25 years earlier. The Altadena Guild organizes and hosts a number of events every year which benefit HMRI (Huntington Medical Research Institutes), and other programs at Huntington Hospital through fundraising, awareness and volunteerism. 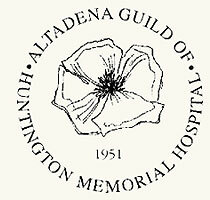 The Altadena Guild of the Huntington Memorial Hospital held its first recorded general meeting on Friday, March 16, 1951, at a tea in the home of one of its founding members, Mrs. Fred Nash. It was the first of a number of Guilds founded in order to extend and enlarge the work of the Women's Auxiliary of Huntington Hospital in Pasadena, California, which had been formed 25 years earlier. The Altadena Guild's active membership was limited to 50 women, and an unlimited number of associates was permitted. Each active member was required to earn and contribute $10.00 through fundraising, and perform a minimum of 10 volunteer service hours per year. Volunteer service options included working in the hospital, helping with field trips for nurses, furnishing new buildings, providing equipment for the maternity wing, and making jams and jellies. In February 1952, the Altadena Guild held its first benefit, a tour of three Altadena homes, yielding a profit of $428, which the Altadena Guild donated to the Hospital for furnishing the offices of the Director and Secretary of the new research building. This began our long relationship with the Research Clinics, which later became the Huntington Medical Research Institutes (HMRI, pronounced him-ree). Donations from the Altadena Guild over the years have been used for the purchase of laboratory equipment, library books, and subscriptions to medical journals, as well as for funding fellowships and special grants. The original line art rendering of a California Golden Poppy was donated to the Altadena Guild by Associate Member Majorie Scott (1967) as a seal for their 50th Anniversary Home Tour. It was colorized by Mike Manning of JAM Graphics for a newspaper ad and served as the inspiration for the new official Guild logo. The Altadena highlands displayed vast fields of golden poppies prior to residential development. By decree of the Altadena Town Council the California Golden Poppy has been named the official flower of Altadena.